This article discusses game-based learning and its benefits in eLearning compared to traditional ways of delivering online learning. Here, you can also download the whitepaper from team Raptivity and explore how one can add game-based interactions quickly to an online course. In the digitized world, we expect everything to be instant and interactive. As per a Microsoft study, the human attention span is merely 8 seconds and we are expected to be swept off our feet in these eight seconds. In the eLearning industry, new concepts are always tried to keep the learners engaged. Out of the proven concepts, one of them is game-based learning. 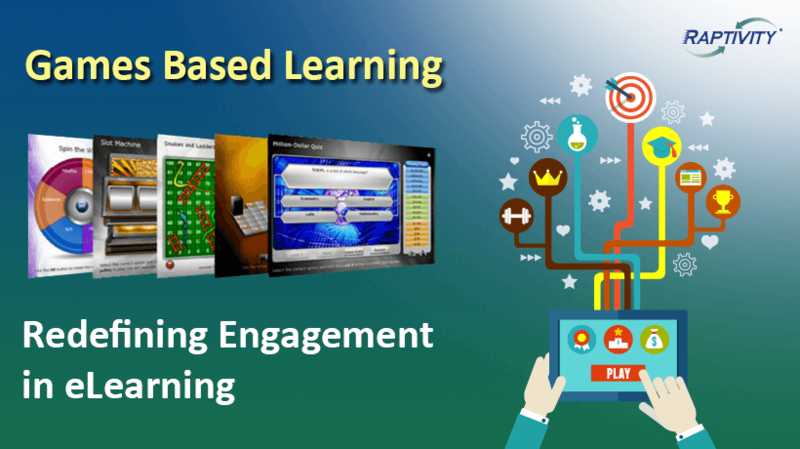 Infusing games in eLearning courses delivers an interactive experience to the learner. In addition, games promise user engagement at right intervals within the learning content. Learning games play a vital role in relaxing learners and impart complex concepts effectively. The fun game elements that are inbuilt in a game-based learning course are the main driving factor for the courses to be interactive and engaging. In addition, games are one thing that everyone from all age groups enjoy. The success of the course then depends only on introducing sound instructionally designed games at the right point within the course. Wikipedia Definition: Game-based learning (GBL) is a type of gameplay that has defined learning outcomes. Generally, game-based learning is designed to balance the subject matter with gameplay and the ability of the player to retain and apply the subject matter to the real world. For example, a role-playing game allows users to be in that position and environment where they are battling scenarios and situations. The learning exhibited from the different levels of the game is phenomenal; grasping capabilities of the user is at its maximum. Game-based learning provides course developers or Instructional Designers the means to create exceptional representation of the lesson that is to be taught. 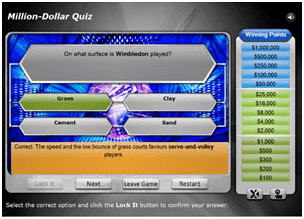 Moreover, with the use of learning games, one can bring life to a regular eLearning course. It furthers assists educators to motivate their learners and elevate them to a new level of learning experience. In a game, several components define the activity present in the course. The major components can be identified as Competition, Engagement, and Immediate Rewards. Let us now dive deep and understand what they mean and know the importance they carry in game-based learning. Users are always competing against each other; the maximum score that they get sets as a benchmark for competition. Then there is team effort, where multiple users are playing as a team to overcome obstacles infused in the game. One of the major takeaways is that scores or winning positions motivate users to explore their skills and learning abilities. The driving factors for engagement are challenge, curiosity, control, and fantasy. These four factors get users completely engrossed in the game where they finish the game in one go; this phenomenon is called as "intrinsic motivation". Infusing the game levels with interactivity is one of the preferred ways to drive user engagement. To keep participation active in the learning course, it is important to reward the user with a token of appreciation. Besides, users get super excited when they receive points or gifts after completing the course. Then there are other types of games, where the unlocking of a level is termed as a reward. These 3 components play an active role in imparting education through game-based concepts. The right combination of multimedia and Instructional Design can result in designing of useful learning games. We at Raptivity combine multimedia with Instructional Design and offer more than 40+ game-based learning interactions. Below is a quick comparison of benefits of designing a course in a game-based learning style as compared to the traditional way. The comparison yields great information about how game-based learning slowly paces ahead of the traditional learning. Raptivity offers a library of 40+ game-based interactions. These games can be easily customized with zero programming skills in few minutes. Raptivity interactions are available in two packs – Essential and Suite. This is your game if you are looking to transform multiple-choice questions into an exciting Million Dollar Game. Test the knowledge of your learners to greater extent as they pass to next level earning scores. It has game elements like levels of complexity, support elements like hint and 50-50 lifeline, with immediate feedback. Increase the interaction bar by spinning the wheel to win. 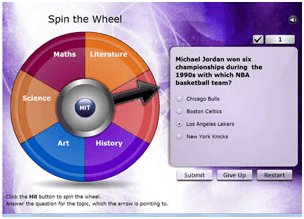 Multiple-choice questions on various topics are presented to your users when they spin the wheel. Questions are based on the topics where the needle rests. It provides game elements like a scoreboard, ability to continue playing even when incorrectly answered, and a surprise element as to where the arrow would rest. It is a great way to reinforce learning before moving on to next topic. Prep up with a set of 20 questions having multiple ranked answers. 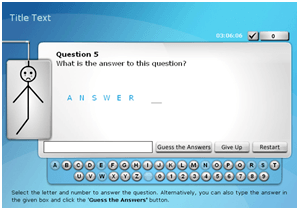 The user is awarded with a point when he answers with a relevant or correct response. A must game to use when educating learners with complex topics. It provides interesting game elements like score, timer, random questions, a number of attempts to get right answers, and so on. A game we all have played for hours! Deep dive into vocabulary, terminology, or concepts. Every wrong answer will put the hangman in a tough spot; learners can save him by answering correct questions. It has various game elements like scoreboard, visual display of hangman when someone selects wrong alphabets, and a great motivation when we save the hangman and it jumps around happily when the word is guessed correctly. Game-based learning cuts the mustard when it comes to imparting education to learners. Whether it is inside a classroom, in a cafeteria, or in training, learners are engaged to learn more if they are presented with content in an interactive way. Game-based learning enhances the learners’ problem-solving capabilities and reduces cognitive load on them. Raptivity supports a pool of game-based interactions. It has helped Instructional Designers and content creators to convert the traditional eLearning courses to use game-based learning in a rapid and cost-effective way. Interested to know more about game-based learning? Click here to download Raptivity's whitepaper “Game-Based Learning: Redefining Engagement in eLearning”.